Out of stock since Tuesday, 26 March 2019. Due back soon. 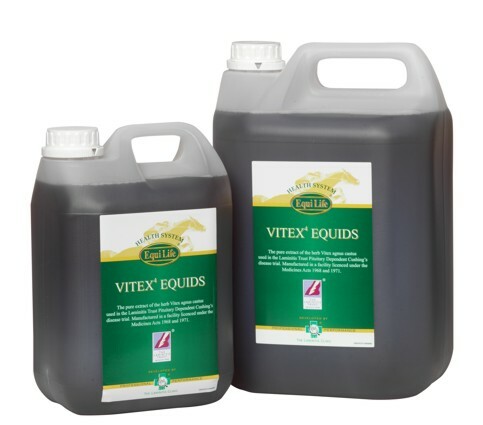 Vitex4 Equids by Equi Life is a specially formulated, supreme quality liquid supplement designed to be fed to horses and ponies with Cushing's disease. In a recent trial by the Laminitis Trust on Cushing's disease, 'all owners reported improvements' after using Vitex Equids. This product can also be used in overly aggressive or uncooperative equids to regulate hormone levels as well as in promoting fertility and a healthy pregnancy. Below are some recent questions we've received regarding Equi Life Vitex Equids, including answers from our team. Vitex is often used in horses with Cushings disease but at present there is no evidence to say it is beneficial to horses or ponies with EMS. However it would not do any harm if you did want to give it a try. Please can u tell me the strength of this product via ratio to purified water in which it is in ?? The solution contains 3% of the active ingredient Vitex agnus castus. Although this seems like a low percentage of Vitex to purified water Equi Life have done studies which show that increasing the concentration of active ingredient in the solution does not increase efficacy. Good changes due to cushings! Hi, my pony has been on prascend for 3 years, in the autumn I reduced his dose to half a tablet as he was very depressed, he improved but the last 8 weeks I have noticed he was tripping ( I was still ride him in walk and a bit of trot for 20-30 mins 6 days a week)and is very sore in his joints so I reduced his work to a 30 min walk every other day and he improved but was still tripping so I took him off prascend 3 weeks ago and he is a different pony, alert, no tripping and back to his usual self! When I first put him on prascend his feet were in a bad way and I had to have bar shoes on for a year but since being on prascend his feet have been great! Has anyone who has had feet problems due to cushings found that the votes still has the same result as prascend on their horses feet? I would be devastated if he got full blown laminitis but I love having his personality back!! Any experience/advice much appreciated! I am afraid I do not have any direct experience of this sort of situation, but I wonder if he has been on the best dose of Prascend and would suggest blood tests now and periodically in future to check on his status. Probably he would be better to go back on Prascend if the original diagnosis was correct. Even that should be re-evaluated, though I presume it was right. Then the dose might need adjusting periodically to get the right level, while keeping his diet and supplements as consistent as possible. Some ponies only need a quarter of a tablet daily to control things. Anything more can result in side effects.